Taking a tough stand against unauthorised constructions in cities in violation of municipal laws, the Supreme Court has ruled that cooperative group house societies can’t construct floors beyond the sanctioned plan. “In the last five decades, the provisions contained in various municipal laws for planned development of the areas to which such laws are applicable have been violated with impunity in all the cities, big or small, and those entrusted with the task of ensuring implementation of the master plan, have miserably failed to perform their duties,” said a bench of justice GS Singhvi and justice SJ Mukhopadhaya. Blasting the government authorities for having “miserably” failed to perform their duties in implementing municipal laws for planned development of the cities, the bench dismissed the plea of a Mumbai co-operative housing society seeking regularisation of the floors constructed in violation of the sanctioned plan. “It is highly regrettable that this is despite the fact that this court has, keeping in view the imperatives of preserving the ecology and environment of the area and protecting the rights of the citizens, repeatedly cautioned the authorities concerned against arbitrary regularisation of illegal constructions by way of compounding and otherwise,” it said. The court was deciding if the orders passed by deputy chief engineer, building proposals (City) of the Mumbai Municipal Corporation and the Appellate Authority refusing to regularise the illegal constructions made by Esha Ekta Apartments Co-operative Housing Society Limited in Worli area of Mumbai were legally sustainable. 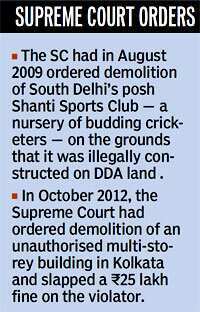 The housing society wanted the court to regularise the extra floors constructed in violation of the sanctioned plan. While refusing to oblige the petitioner housing society, the bench praised the Municipal Corporation of Mumbai for refusing to regularise the illegal construction. “The orders passed by them have given a hope to the law-abiding citizens that someone in the hierarchy of administration will not allow unscrupulous developers/builders to take law into their hands and get away with it,” the bench said.